In what seems like an incredibly short amount of time(just 6 weeks!!! )a 50,000 capacity stadium(track length 560m!!!) was built in Hamburg in 1929.A few years later an estimated 80-102,000 went to the stadium to see a boxing fight between German heavyweights Max Schmeling and Walter Neusel!!! One part of the meeting was particularly questionable and that was the starts.The heats had both standing and flying starts and it was the flying starts that caused a bit of head scratching amongst the crowd.They were told that all 4 riders should cross the start line together,but couldn't understand why the race had to be re-started when 1 rider was behind the other 3.It seemed it was his fault and to his disadvantage and wondered why the delays and new starts........and why no explanataion was given for this!! Ginger Lees won the main race and also set the track record of 78,4 seconds.A German record of 85,3 was set by Count Strachwitz!!! Less than a week later and after the first meeting under floodlights the promoters were so happy they were talking about building a track in Berlin in the same amount of time!!!! And the chance to win a new BMW motor cycle just for buying a programme - WOW! The second meeting was just a few days later on Wednesday evening where another 16,000 turned up to see a Dirt Track meeting under floodlights.The promoter had taken on board some of the criticisms from the first meeting.This time all races were flying starts,the main handicap race was over 4 laps instead of 3,to give those riders starting last a chance to make their way through the crowd, and the racing was much more exciting than the first.It was felt that an average crowd of around 8,000 should be achievable once the novelty wore off. The Golden Helmet event initiated in the meeting of Wed.19th continued weekly and Niss, the winner at that first meeting, ( 2 heats and a Final) took the overall season GH prize with 42 pts. 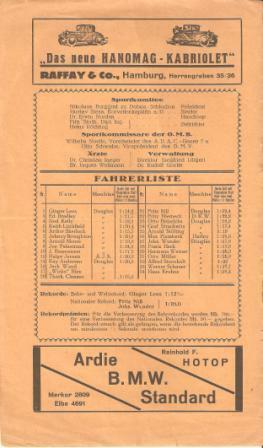 The GH continued in the second season of 1930, to be won by Herbert Drews with 68pts, but in 1931 the event was abandoned after just one mtg, which Drews won. 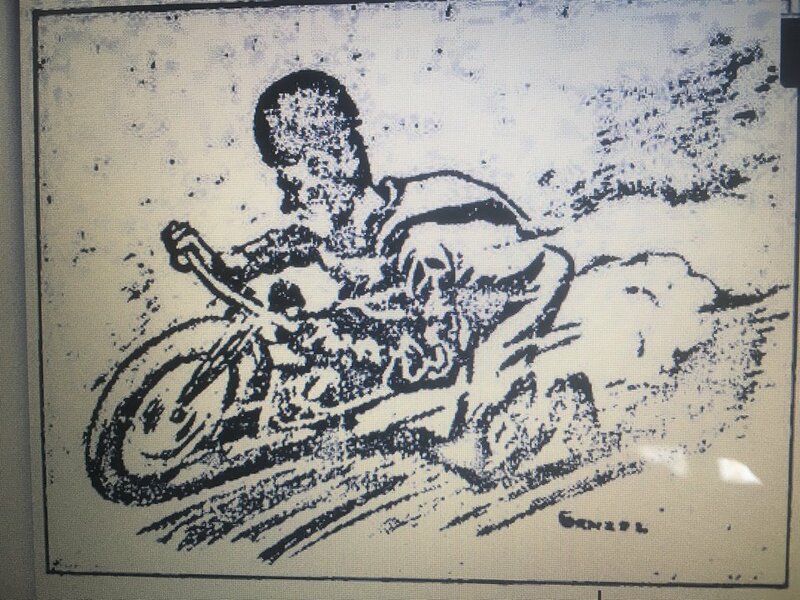 Full details of the weekly GH event winners, 1929- 31 are given in the 'Golden Helmets, A - Z' section of Speedway Champions site, HERE with further narrative as follows: . . . . 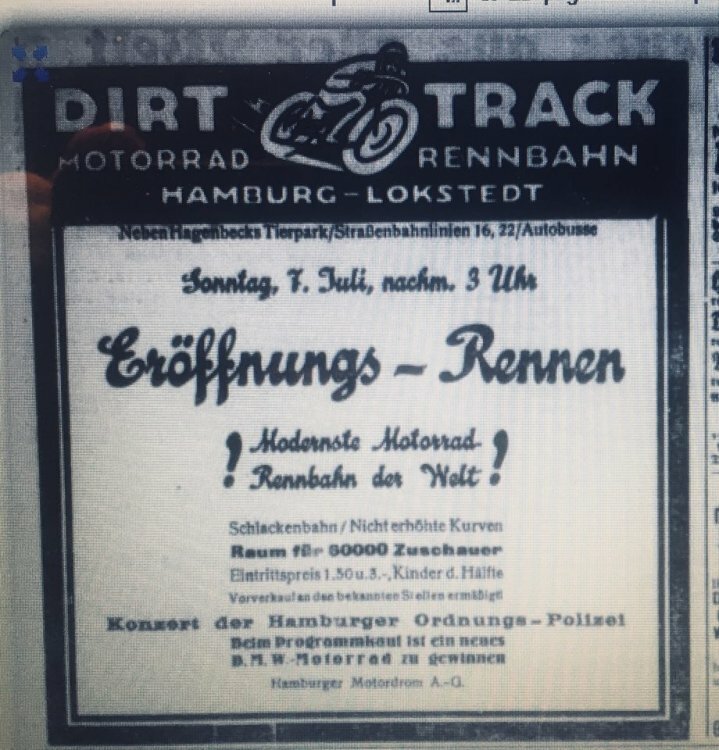 The first purpose-built dirt track in Germany was constructed in the Hamburg district of Lokstedt in 1929 by a UK/Danish consortium, United Speedway Ltd., who operated it alongside its Roskildeveg, Copenhagen site, built the previous year. Each stadium included a greyhound circuit in addition to the 1/3 mile speedway track, and star riders and their bikes, including British stars such as Bill Kitchen, were often flown between the two venues. From the opening Hamburg meeting in July '29 both venues ran a 'Golden Helmet' competition, - see the Roskildeveg GH results, 1929- '31, in the adjacent Danish GH table - , where weekly stagings were restricted to native riders who accumulated points towards an end-of-season total and the award of a Golden Helmet. The first winner was Fritz Niss, who won 4 of the weekly finals and totalled 42 points, (presumably from a scoring basis of 5-3-2-1 that was known to have been the Copenhagen system,) though he was being drawn down on by Herbert Drews toward the end of the year. Drews went on to become the 1930 overall winner with 5 weekly successes and 68 pts. The 1931 competition was abandoned after the initial event, though racing at Lokstedt continued up to 1933. You come in and give the ending away when I am just starting the story!!! Sorry old boy, didn't know it was a soap saga. Anyway,to carry on the story......The next meeting was again on a sunday afternoon and this time only 6-7,000 came to see 'Ginger' Lees and the rest.In the press it stated that one of the reasons for this might be the cost of 1.5 Reichsmark for the cheapest tickets,which was thought to be expensive when travel and food costs were added.And I guess especially so when at this time they were hosting 2 meetings a week.Plans were to add another meeting to the two!!! The first heat was an attempt by Ginger Lees to break his track record.He done the warm up lap and went flying through the start and was going like the clappers when he lost control and flew over the bike,the to the shock of the crowd,his bike straightened up and weaved 30m over the track and suddenly turned and headed for the fence and after the impact lay on the track still running as the crowd ducked for cover.Lees managed to get to his bike and turn the engine off,before the 5 track staff got there. Fritz Niss from Hamburg,although in this illustration he doesn't seem to be riding Lees-esque with his foot forward!! 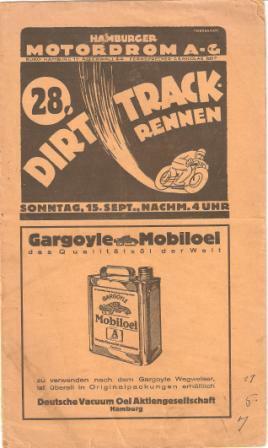 I have in my collection a programme for Hamburg Motordrome which I reckon is 15th September, 1929 & the first name on the list of riders is Ginger Lees. Amazing today to look and see that from the opening meeting on Sunday 07.07 they had managed to run 28 meetings up to the 15th September!! !.Think it was 5 days later when they had their first rain-off of the season,although one meeting was postponed but ran the next day. Ginger Lees doesn't seem to have been at this meeting and in the report for the meeting on the 22.09 it states 'our Ginger is still in Copenhagen!! 'Jst 3 days later for the Wednesday evening meeting (18.09.1929)turned! 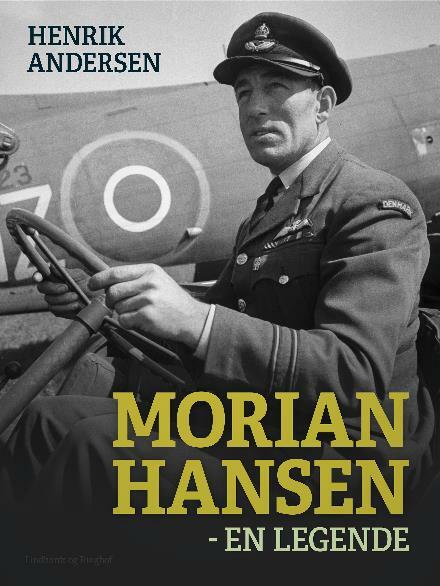 You mentioned Morian Hansen in a previous post. Is this the Danish rider who rode in Britain as well as appearing in a couple of world finals back in the 30's? 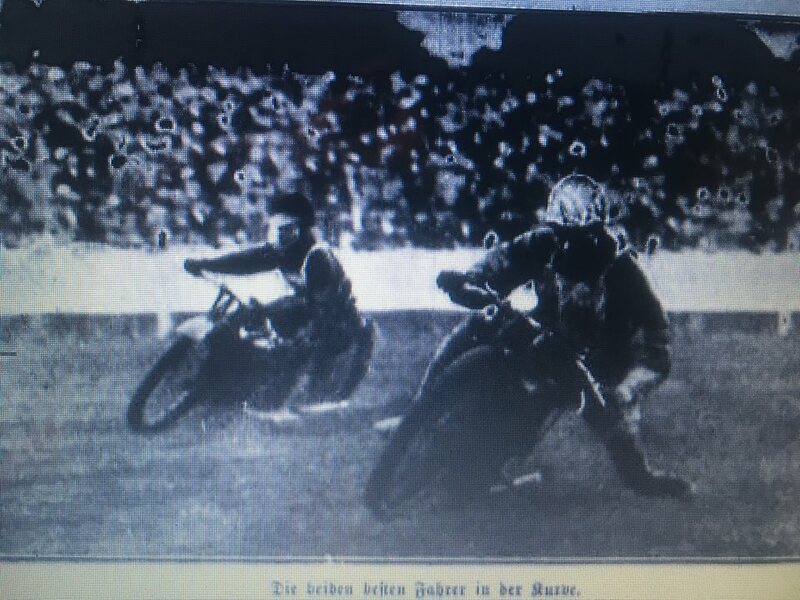 An action shot from the early weeks of the Lokstedt Dirt-Track showing 'the two best riders'.It states Ginger Lees is leading Niels Sorensen,but I wonder due to the styles(it looks like the rider on the left has his foot forward)if they have it the wrong way round? The next Sunday was the day Ginger Lees,the rider who they had already named the 'uncrowned king of the Hamburg track' met his match in King Arthur!! The sunday meeting was staged in the evening for the first time.It was thought necessary to avoid a clash with Football and Boxing,but observers thought the racing under the floodlights was more exciting anyway.In the very first heat before a crowd of 16,000 Jervis made an attempt on the track record held by Lees.He went out storming ,and not only broke the track record but set a new world record for the mile of 73.8(73.4 was reported in the UK)In the highly awaited clash between Jervis and Lees,it was a bit of an anti-climax as Jervis was in a class of his own and Ginger Lees couldn't find a way past Niels Sorensen.Jervis finished almost 5 seconds ahead of Sorensen and the rest even further behind.